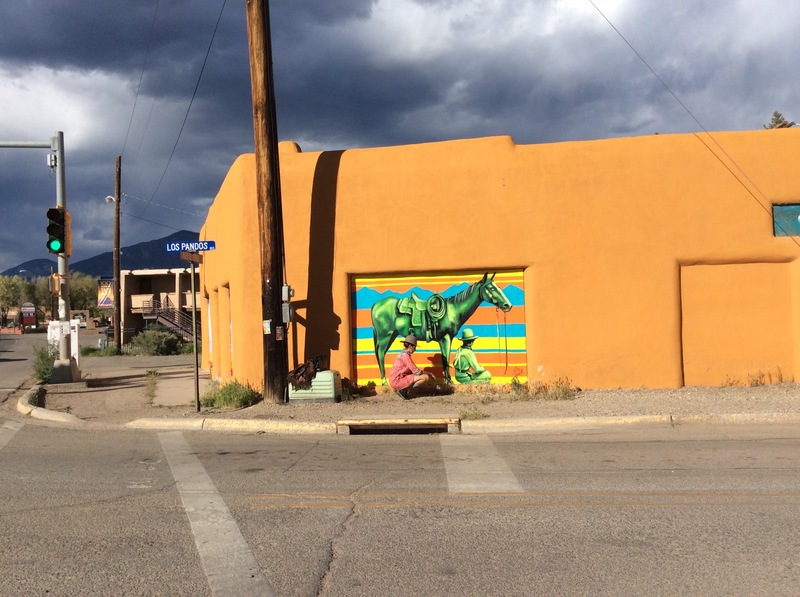 If you live in Taos or have visited over the past week or so, I’m certain you’ve seen the green horse and (resting) rider on the front of the building across from Smiths. 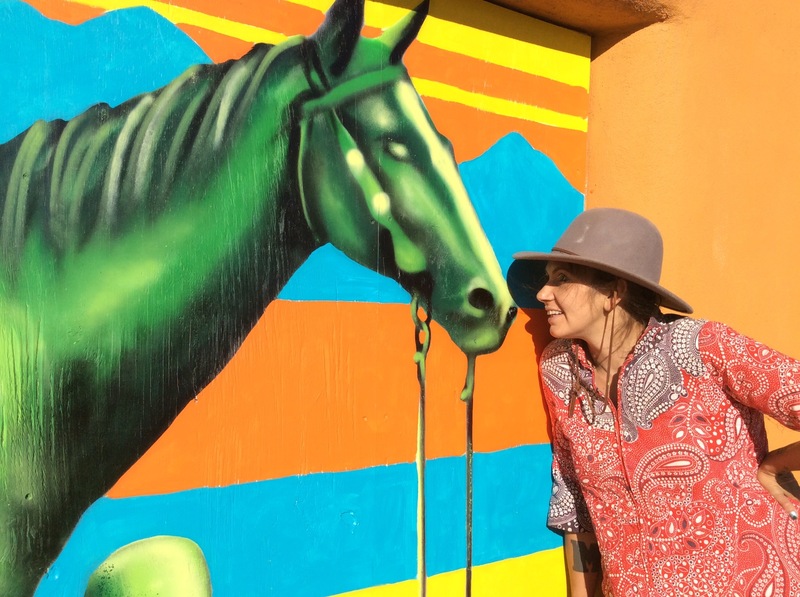 Jules Muck, who is based in Venice, California is a renowned street artist who has made a name for herself, painting the town wherever she goes. A year ago my friends Janie Romer and Mark Barker bought the Stakeout and have been renovating and getting it ready to open as an event venue with occasional pop – up dinners and parties open to the public. 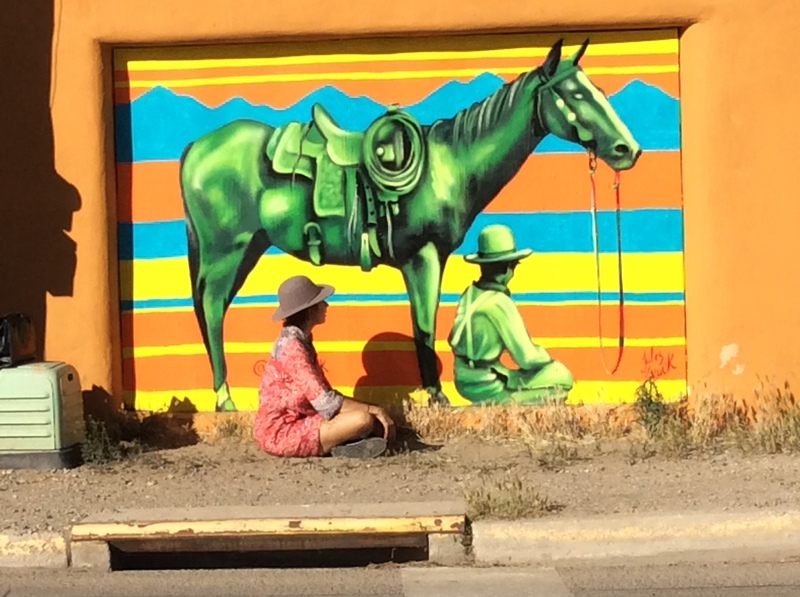 Jules, who is a friend of Oscar Burnett’s (Janie’s son) was commissioned by Mark and Janie, to paint Billy the Kid and his horse where Los Pandos meets the Paseo. Legend has it that Billy hid out on Outlaw Hill, where the Stakeout was built. 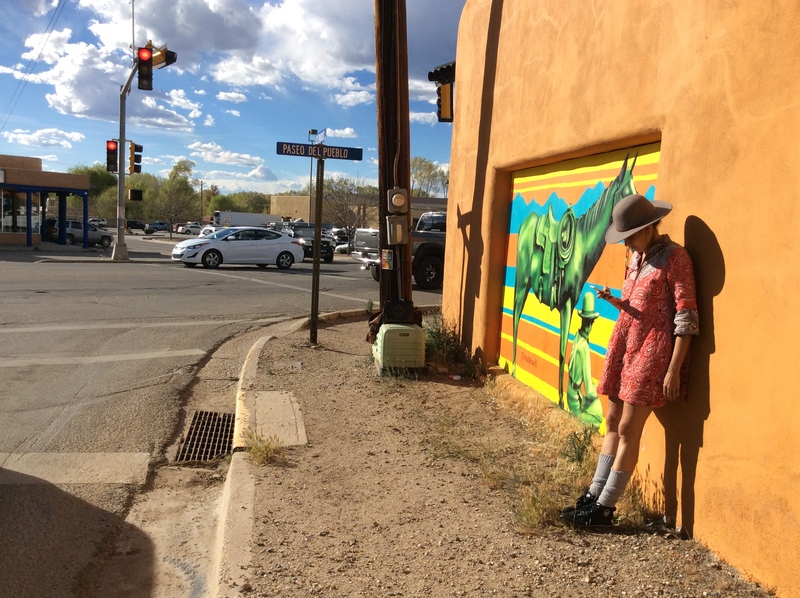 There’s still a little way to go ’till the Stakeout opens in the late summer/autumn of this year, but art and Taos go hand in hand and thanks to Mark and Janie (and Jules of course), there’s now something to look at while we’re stuck at the light. The building that Jules has graced with her paint, serves as a temporary home for Oscar’s art studio and has nothing to do with the Stakeout except for the fabulous billboard opportunity! Jules already had a connection to Taos via Henry Hopper and Robby Romero. She appears in Native Children’s Survival’s music video, Who’s Gonna Save You, filmed in New Orleans a couple of years ago, and met Oscar through Henry (who were introduced to one another by my daughter Genevieve, soon after Oscar arrived here last year). It’s a small world, especially in Taos. For more on the very talented Jules Muck, please visit her site linked below. Thanks for the great shots, the great art and fabulous you!